This is the fifth and final post in my Christmas in July series. If you missed any posts, you can see them all by clicking here. Hello! I meant to have this posted yesterday, but we had no internet connectivity during our travels. Better late than never I guess! A few days ago in the post about Christmas Gifts, I mentioned that Creative Memories has so much to offer when it comes to creating calendars that I wanted to do a whole post on them, so here we go! 1) Unique sizes and features. 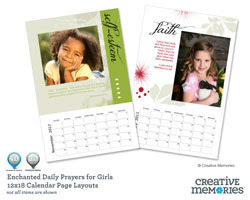 Choose from three sizes: Desk Calendar (10x4), 12x18 or 8x12! 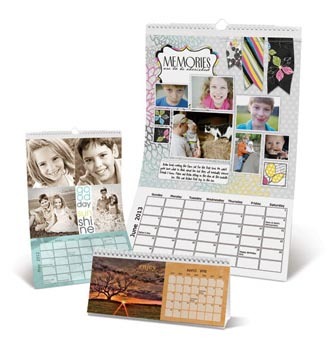 All three offer unique perforations that allow you to remove the page from the calendar grid and put it in a PicFolio Photo Album. It's like giving two gifts in one - give a calendar (and possibly an album in a coordinating size) and family members can keep this years' memories for years to come. 2) Easy to create using Storybook Creator Software. 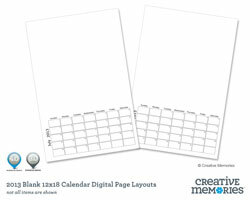 Quickly drag and drop your photos into the free flattened layouts or purchase pre-designed calendar pages. There are even videos to walk you through each step of the process for each size and style of calendar. Don't have Storybook Creator Software? You can download a free 30 day trial version to create all your calendars! 3) Quality manufacturing. The calendars are printed on archival, heavy weight cardstock. 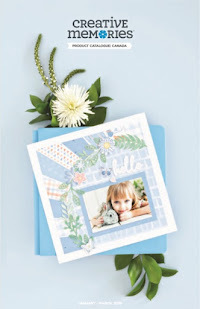 This is perfect for when you are ready to slip the layout into an album - you know it will last. And each calendar is spiral bound so there are no punched holes that will rip and tear. 4) You can begin in any month. Most of us will start with January, but if you wanted to start a calendar in September for example, there's no problem! And, each part of the calendar grid is customizable with your own text including choices of font and style etc. You can see and download all the free Calendar artwork here! You can also purchase a wide variety of templates that you can see here. With so many great options for calendars like these, you'll never have to settle for a boring calendar again! I want to share one of the best gift ideas I have seen in a long time - a Pre-Decorated Baby's First Year Calendar. The calendar is non-dated, so it can start whenever baby is born. Parents can write in little milestones that occur and simply add a few photos from each months of baby’s fist year to end up with a beautiful record with very little work! Add an album for mom and dad to slip the finished pages in and baby’s first year album is done! 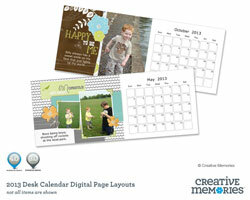 The Simply Fabulous Baby's First Year Pre-Designed Calendar Templates includes both little boy and girl templates! And I love the Click and Fill Calendar Templates...they allow you to take a pre-created page and add your own choice of papers and colors to it! Here's another great option for a Desk Calendar with beautiful layouts ready to go...just add your photos! 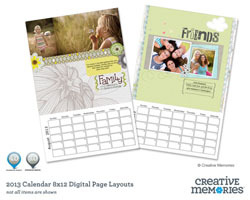 Once you have chosen your calendar style and added your photos and text, you can purchase them by uploading them and ordering them through the Creative Memories Digital Center. 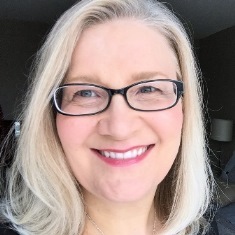 You will need to input a consultant ID number as you are completing﻿ your purchase - if you like, my ID number is #75483791. If you choose to use my number then I will be able to help you with any difficulties or questions you might have! 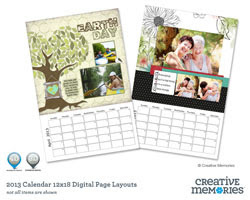 A little tip...Creative Memories often puts Calendars on sale in the fall in preparation for gift giving...you might want to create and upload your calendars now to your digital center account and then watch for the sale prior to ordering! Make sure to sign up for my monthly CM newsletter so you know when all the sales are coming. Simply enter your email address in the sidebar and you'll automatically receive next month's newsletter when it goes out! And as ever, feel free to contact me...whether you need help with a Calendar or other project! 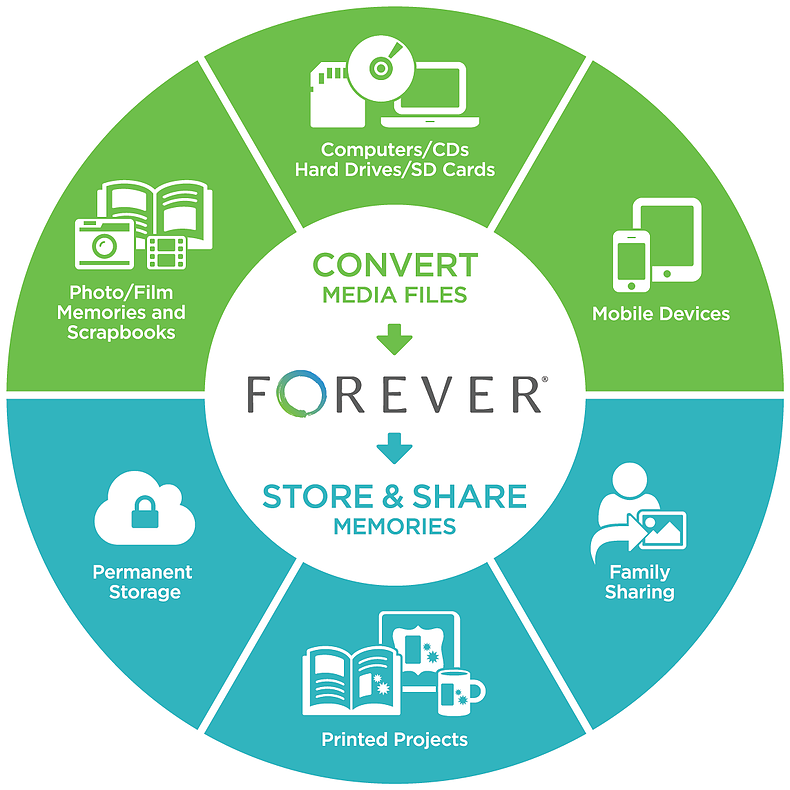 I love being able to help people preserve and share their photos and stories! So friends...that concludes my little Christmas in July series. I hope it helped inspire you to get a head start on your Christmas planning this year! I'd love to hear what you did as a result - please feel free to post a comment below! We are heading back home and I will resume regular postings next week. I'll be sharing some vacation layouts and talking about my School of Life albums too. See you soon!